What is the room size needed for my pool table? It is important to buy the right size Pool Table to fit in your room. Making sure you have enough cueing room around your pool table is an essential. Generally we suggest allowing 1.5 metres of cueing room around each side of your table. We have a chart below that will help guide you further but if you really want the correct answer we can measure your room so you have a great playing experience. 7ft x 31/2ft – Pool table leagues. 9ft x 41/2 ft - Full sized American Pool Table. 12ft x 6ft- full tournament sized tables available in Pool tables and Snooker Tables. The standard cue size is 48" and most pool tables come with this size cues, but off course there is a range of longer or shorter cues if needed, custom made cues and shorter half length cues. The best way to explain how much cueing room you're going to need around your pool table is to find the middle of the space you are intending to use and go out by the shape of the pool table you think will fit. (you can put 4 objects down to make the shape) then go another 1.5 metres from each object that shapes your pool table size. 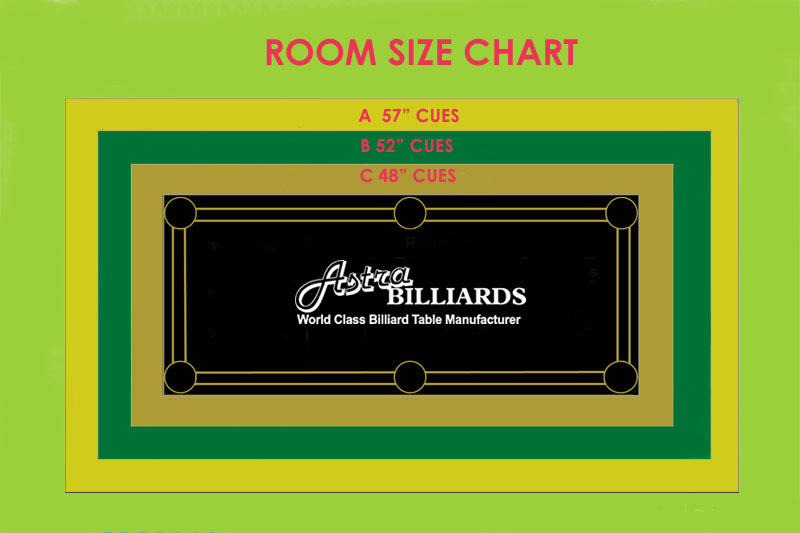 We can assist in measuring up the correct room size to match the Pool table. Astra Pool Tables quality pool tables at affordable prices. Call us (03) 9791 5100 for advice of working out the correct room size for your Pool table in Melbourne. Room sizes above are for ideal playing space (1.5m) from inside edge of cushions around the table with standard cues. However, with the use of shorter cues a smaller size room can be utilized.